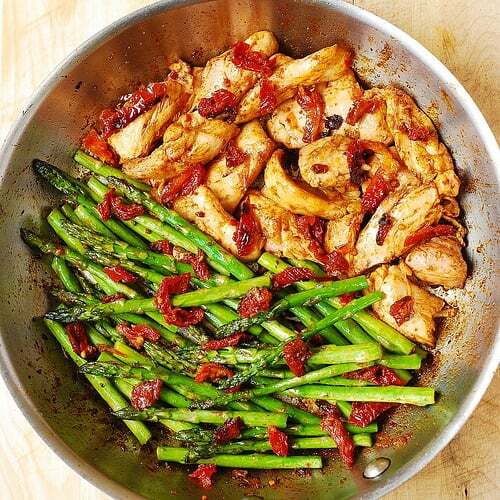 Paprika Chicken, Asparagus, and Sun-Dried Tomatoes Skillet – delicious, easy-to-make, 30 minutes from start to finish Mediterranean dinner! In this recipe, I used boneless, skinless chicken thighs cooked in paprika and sun-dried tomatoes. I loved how the chicken tasted: super flavorful, moist, tender, easy-to-cook and easy on the budget! 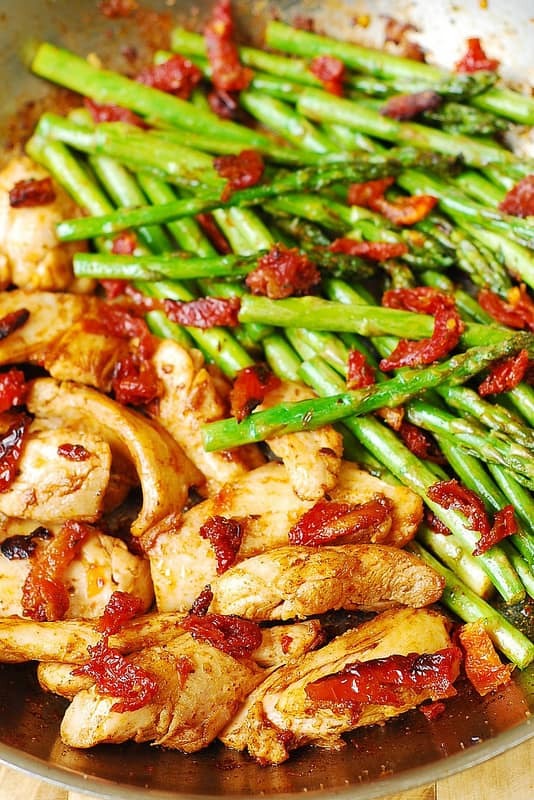 Chicken and asparagus go so well together, just take a look at these recipes: One-Pan Pesto Chicken and Veggies and Basil Pesto Chicken, Tortellini, and Veggies. The recipe is basically done in 2 easy steps. 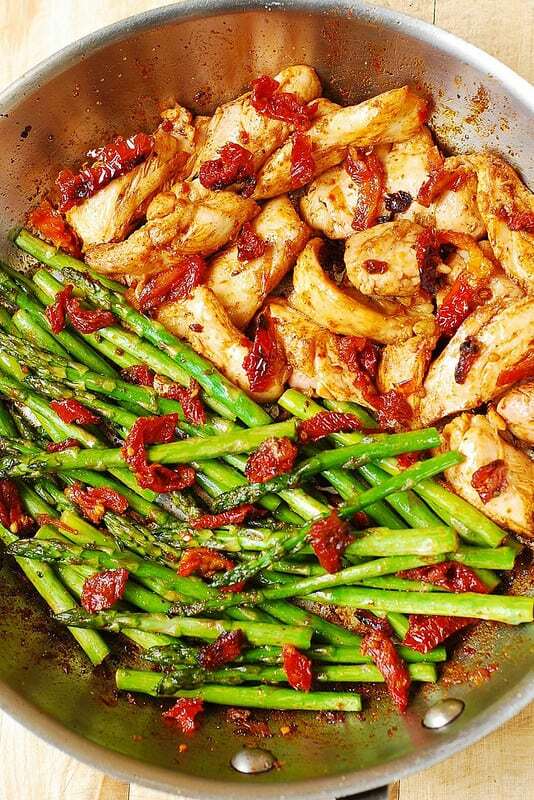 Then, remove the chicken from the skillet, and cook the asparagus (ends trimmed, cut in half) with some more chopped sun-dried tomatoes. Sprinkle some salt over asparagus as you’re cooking it. Finally, add the cooked chicken back to the skillet, reheat, and serve. Your Mediterranean dinner is ready. In 30 minutes! 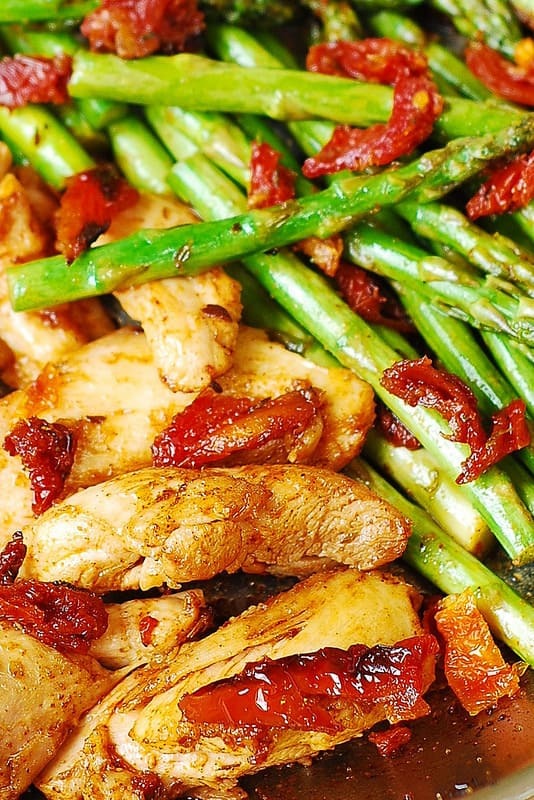 Easy and delicious Mediterranean recipe: skinless, boneless chicken thighs cooked in olive oil with paprika and then tossed with asparagus and sun-dried tomatoes. Only 30 minutes from start to finish! Chop sun-dried tomatoes (drained of most oil) into smaller bites (I used julienned sun-dried tomatoes). Heat half the amount of chopped sun-dried tomatoes and olive oil in a large skillet on medium heat. Add boneless, skinless chicken thighs, sliced into thinner strips. 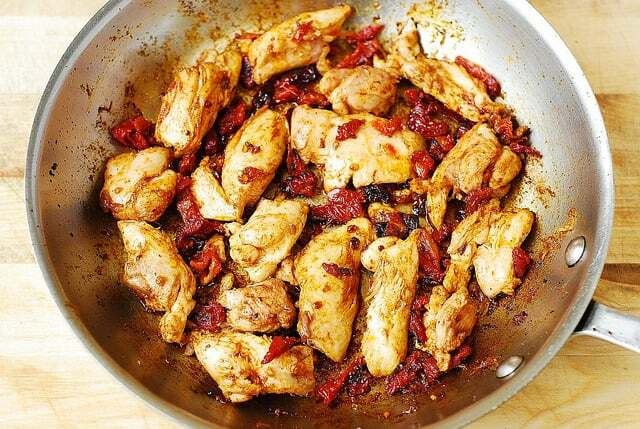 Cook the chicken in olive oil and sun-dried tomatoes. While cooking, season chicken thighs generously with salt (about 1/4 teaspoon), and sprinkle with paprika from all sides (use either 1/4 teaspoon or 1/2 teaspoon paprika, to taste). Chicken should be nicely colored but not too red. Cook chicken until completely cooked through. Remove chicken from the skillet, leaving the oil in the skillet. 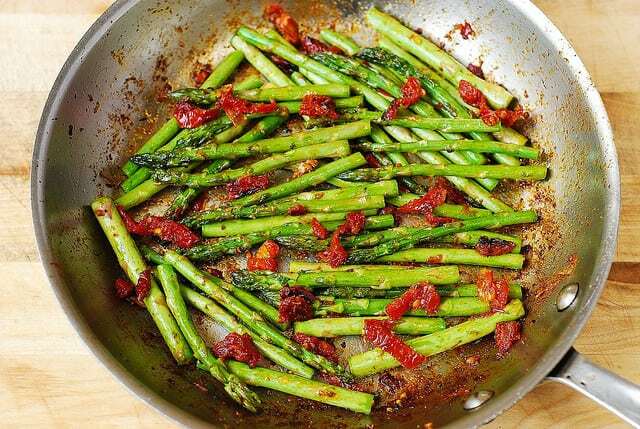 Add asparagus to the skillet with the remaining half of sun-dried tomatoes. If there is not enough oil in the skillet from the chicken, add 1 tablespoon more of olive oil (from the jar). Season asparagus generously with salt, and cook asparagus with sun-dried tomatoes in olive oil on medium heat for about 5 minutes. Remove from heat, cover the skillet with the lid, and let the asparagus continue cooking, off heat, until crispy. Add chicken back to the skillet, reheat, and serve. My sun dried tomatoes burned before the chicken was cooked through. Ugh! I like this recipe, and have made it many times. I would like to know how long to leave the asparagus covered off the heat? Thank you, Sean, I am glad you’ve been enjoying this recipe. Keep the asparagus covered in the pan, off heat, for about 7 minutes – by that time it should be cooked through but still crispy. Loved this recipe! We are new to Paleo and love everything we are Trying! This is definitely a do over. Not too much salt so you can taste the flavors. Thanks!! Thanks for this recipe. My folks like heat so I turned up the heat by using half smoked paprika and half regular paprika. I also added a dash of cayenne which also helped to bring out the flavor in the asparagus. Great additions to add more flavor! What is the nutritional value on this meal. Carb and cholesterol, suger. This recipe was so delicious!!! I’m not a fan of thighs, so I used chicken breasts. The only changes I made were to serve the chicken and asparagus separately, serve it with Jasmine rice (didn’t have ingredients on hand for a salad). Disappointed in this recipe although could have guessed just from the minimal ingredients. I fried bacon with the asparagus and mixed it all together but definitely could have used more of a variety of spice.